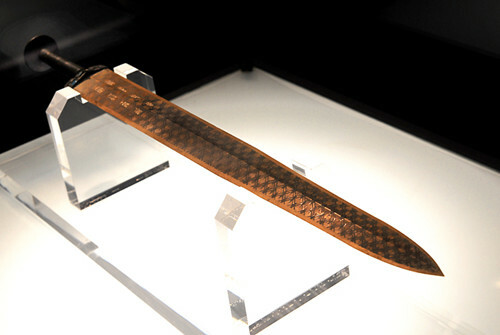 The bronze sword of Goujian was excavated from a tomb in Jingzhou, Hubei province. It dates back to more than 2,000 years ago. The sword is 55.7cm long, decorated with exquisite patterns on the surface. Although it was buried in the tomb for such a long time, it hasn’t gone rusty. Testing shows, the sword is very sharp; it could cut 20 pieces of hard papers into pieces. According to the reserch on the sword, the expert found that the material of making it was complicated. It was made of alloy of copper, tin and lead, etc. Especially, the content of tin was much higher at the blade. So it increased the hardness of the sword which definitely making it sharp. The bronze sword of Goujian is the most exquisite sword which had been found so far, also a national treasure.